BELO HORIZONTE: Brazil's emotional reaction to Neymar's injury played into Germany's hands as they inflected a record 7-1 World Cup semi-final defeat, German coach Joachim Loew said on Tuesday. A fractured vertebrate suffered in their quarter-final win over Colombia ruled Neymar out and with captain Thiago Silva suspended, Brazil fell apart on an emotionally-charged night. There were constant reminders of Neymar's absence at the Mineirao Stadium before kick-off with captain David Luiz and goalkeeper Julio Cesar clutching the Number 10 shirt bearing his name during a deafening rendition of the Brazilian anthem. But Loew says Brazil lost their cool which allowed Germany to score five goals in 30 incredible first-half minutes to put them in Sunday's World Cup final. "It was important to meet this passion and these emotions with calm, courage and with our own strength," said Loew whose side will now meet Argentina or the Netherlands in Sunday's final in Rio de Janeiro. "They were shocked by our goals and it made the game easier for us. "Everyone did their jobs incredibly well and with total concentration. "We played well going forward and combined superbly." 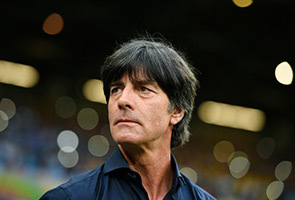 But Loew said the Germans must stay humble despite inflicting Brazil's record international defeat on the hosts. "A bit of humility would also be very good and we need to be careful that we stay concentrated on Sunday," said the 54-year-old.